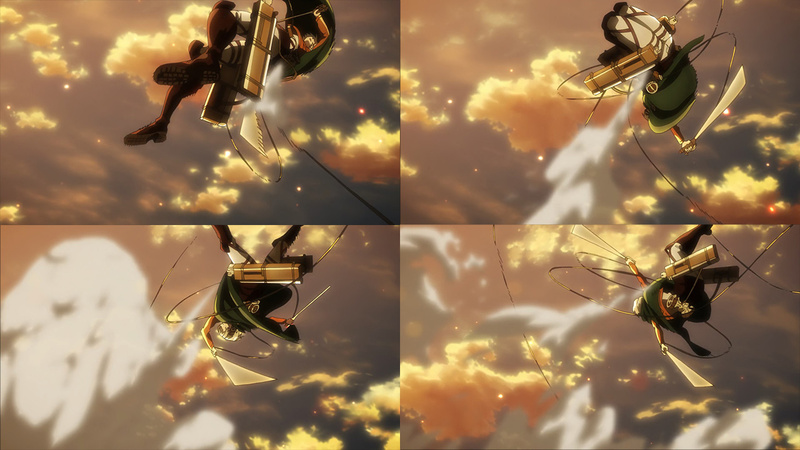 The Attack on Titan coverage is back to tackle a downtime episode storyboarded by studio WIT’s most interesting director, and a more action packed one that allowed the show’s animation star Arifumi Imai to once again show off his skill. Tune in for some anime industry history, overviews of the work of some spectacular creators, and some more detail on how WIT operates. — Ryotaro Makihara appearing as storyboarder is an exciting event, moreso when you consider that WIT’s most interesting director hadn’t handled an episode before, as he was busy with his film HAL during the first season. 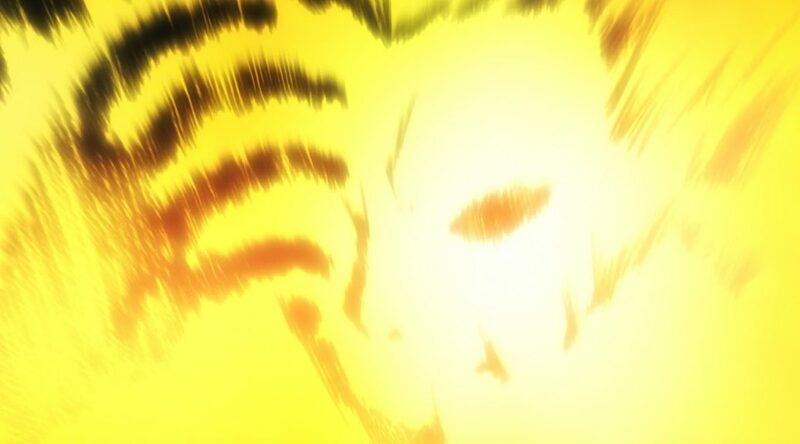 He might not be the creator with the most visible flair at the studio, since it’s hard to top Tetsuro Araki in a shouting match, but his work has the kind of texture that makes me wish he had been the one tasked with The Ancient Magus’ Bride instead. Makihara is very much an animator at heart still, and his path as an artist is rather interesting; he started off at Telecom but honed his skills at ShinEi Animation, which had quite the impact on him as a creator – more on this later. It was likely his work at ShinEi, where Masaaki Yuasa has his roots too, that led to him becoming de facto Kaiba’s main animator, even debuting as animation director on episode 11. His relationship with Yuasa continued as he became one of the key players in Tatami Galaxy as well, once again making another important step in his career when he directed and storyboarded an episode for the first time. Their paths diverged after that, but by that point it was obvious that Yuasa was no fool and that he’d discovered yet another industry gem. The last few years of his career follow a more standard pattern: he got a contract with Production I.G (for Guilty Crown of all things), then got recruited for the newly formed Studio WIT where he’s exclusively spent the last 4 years. WIT’s management can be rather dubious, but their producers’ ability to attract talent should never be called into question. Makihara has already directed two movies at the studio, so perhaps they intend for him to lead their theatrical ambitions. — As I said before, Makihara’s experience at ShinEi had a massive impact on him. Anime is known for its shortcuts to expression, but it wasn’t always like that. Had Toei Doga’s articulation of acting become the predominant trend in the industry, we would see more thorough character animation as a rule; sequences that don’t only depict the two exaggerated ends of emotional progression, but everything that’s inbetween as well. That approach died out almost entirely though, as those principles were only majorly inherited by ShinEi, and their golden age is long gone beyond their theatrical work. Nowadays, their only heirs are creators with roots at the studio at least 1-2 decades ago…and Kyoto Animation at large, of course; their isolation from the rest of the industry has allowed them to maintain the spirit their key creators carried from ShinEi – one of the many reasons their work feels so at odds with anime at large. Sadly, this episode simply didn’t give Makihara many acting opportunities, and even if it had the project doesn’t necessarily have the right crew for this kind of work. It’s understandable that he was tasked with a comparatively low-key episode though, with less grand events and more character moments. The very first scene in the episode, immediately following up last week’s ending, is the most illustrative example of his approach: despite the limitations, there are many natural little movements in this sequence that would be skipped in a standard anime production. None of them tell you a lot more about the characters, but their demeanor still feels way more believable because of them. — If I’m going to complain about something direction-wise, it has to be these scenes in the shadows. They’re conceptually interesting, and the complete silence only broken by their nervous breathing is unsettling, but the execution is otherwise kind of awful. 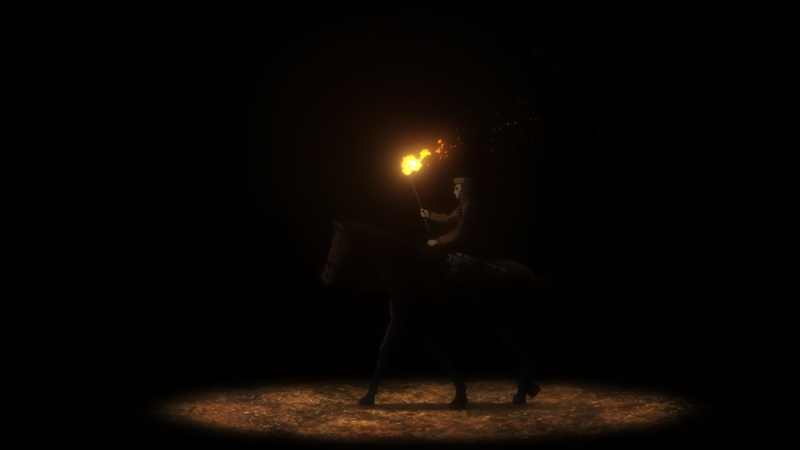 It doesn’t look dark so much as empty, and the nonsensical lighting makes it feel like a convenient videogame mechanic. Guiding the eye towards the 3DCG horses that the rest of the series has done its best to hide isn’t the greatest idea either. This show should experiment with horror more often, but this attempt was awkward at best. — Atsuko Nozaki’s presence as animation director and top key animator is noteworthy. Her soft art isn’t what you would expect on a series like this, a gap noticeable even in the illustration she tweeted to announce her work. But the truth is that she’s built a bit of a relationship with WIT in recent years, becoming a good ally of Makihara in particular. Their work together highlights that delicate doesn’t mean frail, so an animator with her particular skills is perfectly welcome to work in crude stories. — The chief animation director rotation is operating as expected, so this episode was given to Satoshi Kadowaki, who has become quite the valuable asset for WIT; his origins are at Kyoto Animation, the studio where he started during the early 00s and that raised him to be an animation director. He departed during the studio’s biggest talent leak around 2007, becoming a freelance animator attached to Yamakan…but just like almost everyone in a similar situation, he eventually stopped working with him at all. His freelancing led him to collaborate with Production I.G, which worked out so well for him that it earned him a place of honor when studio WIT was founded. Nowadays he’s one of their main designers and supervisors, and his still delicate yet bold style (rather literally too, just look at his outlines in Seraph) has had a huge impact on the aesthetic of many of their projects. — Takuma Ebisu returned earlier than expected to his action duties, but did a good job nonetheless. His most hectic scene features all the personal tells I brought up last time, like the arcs left by the blades. What stood out the most to me though was the attention put at the end of it, giving just as much care as the landing and movement dying down – chances are that this was due to Makihara’s storyboard as well. When it comes to other animators, I’d like to point out that Kazuto Arai showed up as well. He’s one of the rising FX stars, though sadly his work got hit by nasty broadcast dimming so you’ll have to wait for the blurays to see it in its explosive glory. — Last time I left fairly hopeful messages about the state of the show’s production, and the show replied with this kinda worrying fleet of animation directors. I hope people understand that the idea that this project has had four years and thus should be in a much better shape than the first season is nonsense; the show did get immediately greenlit as the directors themselves have acknowledged, but it’s been stuck in preproduction for an outrageous length of time, so they only started animating it a few months ago. I still believe that it will end up faring better overall, but let this serve as a reminder that things going south is entirely plausible. — Since we’re on that note already, remember how I explained that Studio WIT’s approach to promotional videos is a bit insincere? As it turns out, they’ve decided to be honest about their lies – this episode explicitly credits Arifumi Imai for the storyboard of the PV, thus admitting that the footage was prepared independently from the show’s actual production; since they knew those events would be depicted in the series, they got their action ace to prepare a fancy sequence for the studio to animate early and get all fans excited. This might explain why the first and second PVs, despite being 3 months apart, feature virtually the same footage: the first one was prepared early, whereas the second was edited with the real troublesome production going on, and the show as a whole hadn’t really advanced beyond what they had teased. — Worrisome signs aside, Arifumi Imai once again stole the spotlight with ease. The transformation scene felt as memorable as it needed to be, in no small part thanks to him; the unmistakable bolts, that striking impact frame, and of course the genuinely fleshy morphing. Imai has the visual charisma to mask even the awkward manga panel-like composition of some shots and turn them into an impressive sequence. And his titan-slaying is of course as awe-inspiring as ever, prioritizing the showcase of spectacular effects over everything else as usual. Knowing that he was the one who actually came up with some of these cuts wasn’t much of a surprise after watching the episode, since they feel like the quintessential Attack on Titan setpieces, and Imai is the person who more or less defined the show’s action. If this is the element of the series that appeals to you the most, you should be immensely grateful to him. 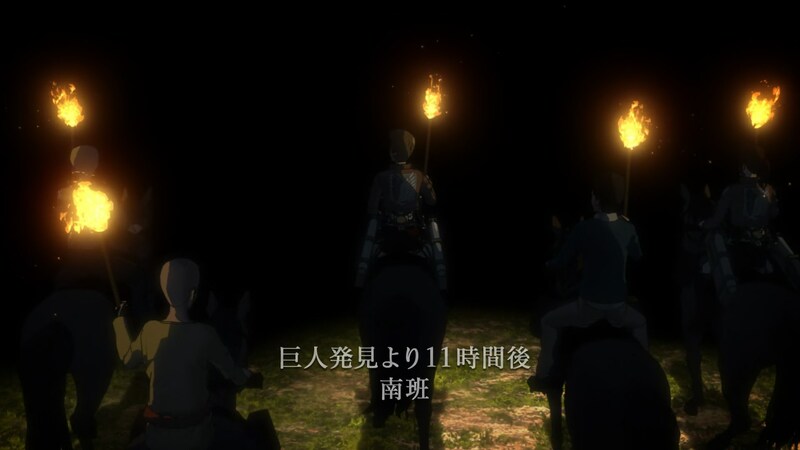 — On the less fortunate end, but also in notoriously Attack on Titan fashion, this episode had some awkwardly stiff moments. 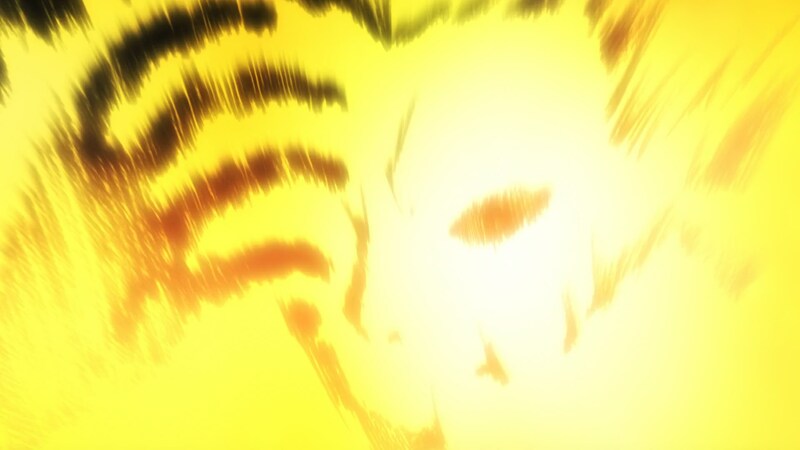 This isn’t always due to energy conservation, since Tetsuro Araki made impactful still shots part of the show’s visual lexicon since the very beginning, but regardless of the intent the result is sometimes hard to justify. 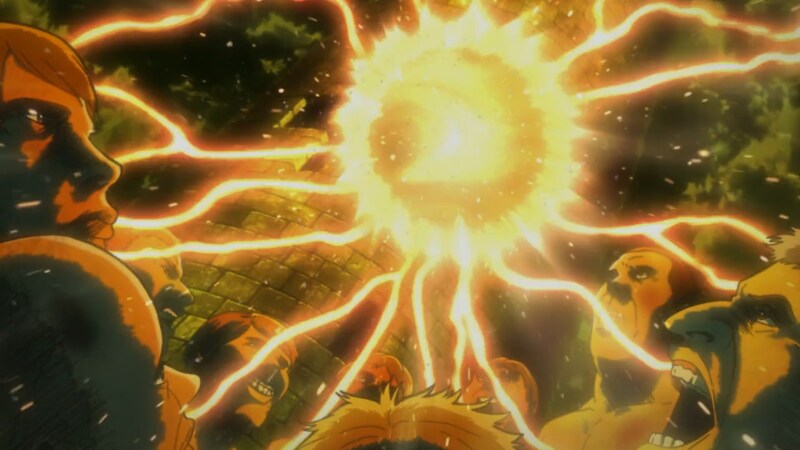 I feel like the show’s new makeup animation process might allow them to get away with those a bit better, though; moments like this would fall flat on their face if they hadn’t made the group of titans actual nightmare fuel with the extra layers of creepy detail. And while we’re on that, my condolences to the makeup animators who had to adorn the end of Imai’s sequence in motion – it does look great, though! 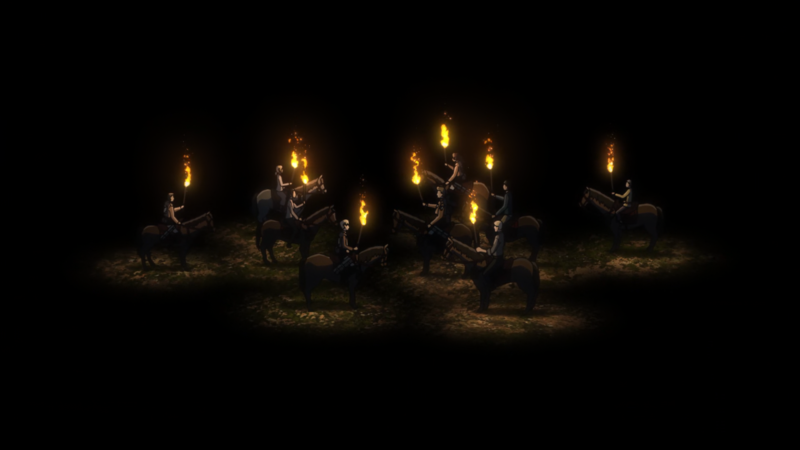 I’m glad I wasn’t the only one bothered by the fact that the light of the torches had strict limits. The characters looked like they were walking across an abyss. The transformation scene was my highlight. I was wondering why the transformation bolts appeared so novel yet familiar. Thanks for answering that. I actually laughed when the moon appeared and they suddenly existed in an actual world. It’s a shame because it could have been a tense moment with more finesse. And yep, Imai’s effects are equal parts impressive and very personal tells! The action scenes feel great but that’s not the weakness of the anime. This season will feature some heavily emotional moments on the second half that will have no action and will be mostly talking. What I hope to see is these scenes making justice to the characters without unnecessary drama added. The manga is great at conveying emotion so I hope to see the same from the anime. Flashy action scenes are cool but shouldn’t be what the studio primarily focuses on. Kadowaki must have eventually realized that Yamakan was a chooch and left him.